Bank of England governor Mark Carney says public faith in financial markets has been shaken by "widespread misconduct". Markets have been "tainted" by scandals to an extent that the public now question their integrity, Mr Carney told the BBC. An "open forum" that includes the public will look at how markets can have "a positive future". Mr Carney said it was important that all sectors of society had their say. Chancellor George Osborne and European Central Bank President Mario Draghi are also attending the forum. Mr Carney said: "Markets lose their social acceptability if they're not viewed as being effective, not working well, that's the first aspect. "They also lose that social acceptability if they're viewed as not having integrity. If there's a series of scandals, there's a perception of ethical drift. "There was widespread misconduct in certain parts of markets, which tainted markets more broadly and required a forceful response," he added. 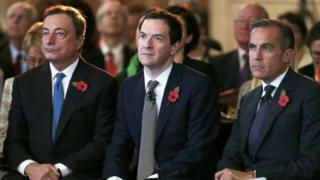 Chancellor George Osborne said he shared "some of this frustration and anger" that the public feel towards markets. "If you go and shoplift at the local WH Smith, you go to prison, but the market trader on the trading floor of a big investment bank, and you rip off people to the tune of millions of pounds, there are no criminal offences available to deal with you," he said. There was a lot of "totally understandable anger" over the last five years over the "biggest single economic crash of our lifetimes". "The idea that just a couple of years on. you can go. 'Oh well, let's forget about all of that' and move on is a bit optimistic. It's going to take time and the financial services sector, and indeed in the regulators and the politicians responsible, have to prove to the public that things really have changed." He added that people needed to see there were "tougher laws and tougher regulation, and people who commit crimes go to prison, that the banking system if it gets into trouble or individual banks that get into trouble will be bailed out by their creditors rather than by the taxpayers, and that there will be openness and transparency". About 400 people are attending the forum at the Guildhall in London, with about half securing their places through a public ballot. Hundreds of schools are also screening the event.